This is the third Artist-in-Residence project initiated by the Winnipeg Arts Council, through the Public Art Program. 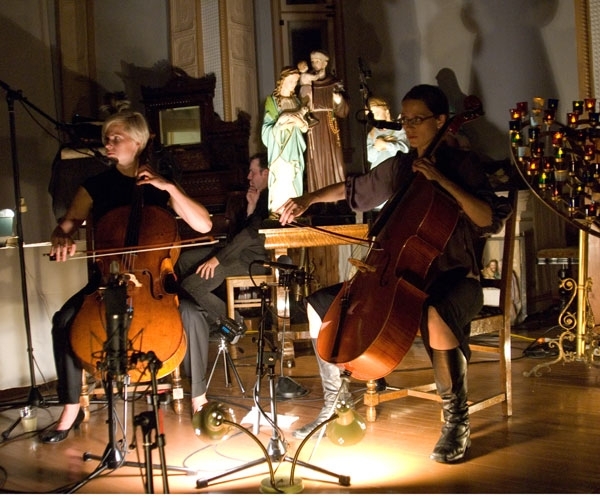 Recent residencies have taken place at the Living Prairie Museum and at the City of Winnipeg Archives. The goal of the program is to integrate artists and their ideas into City facilities to explore civic resources, history and identity through the creative process. 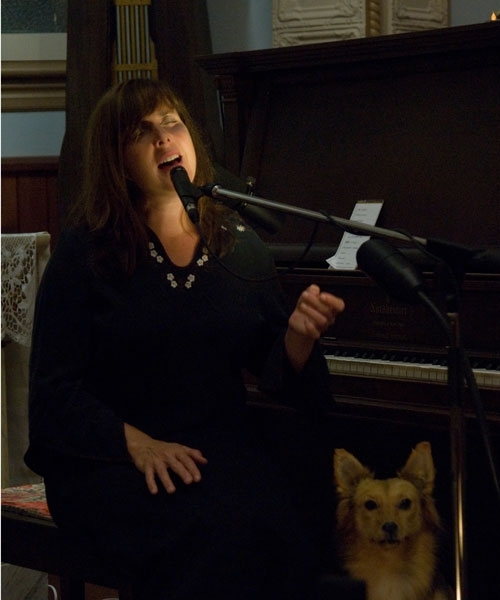 Songwriter Christine Fellows was selected as Artist-in-Residence for Le Musée de Saint-Boniface Museum for 2009. She spent six months combing the collections and collaborating with the staff to create a multi-disciplinary work that is a poignant reflection on Saint-Boniface history. 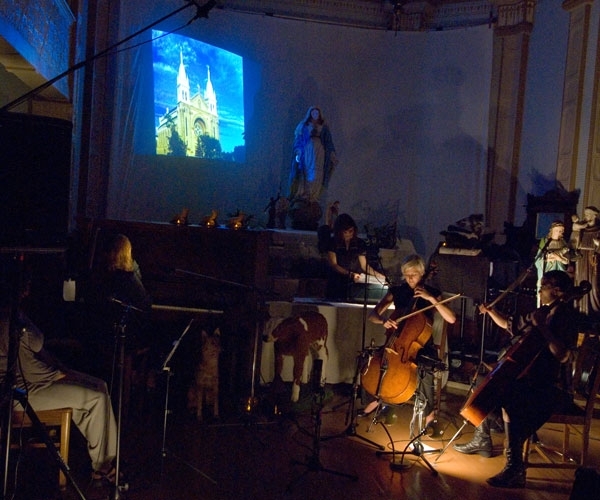 Reliquary/Reliquaire was performed live with a four-piece ensemble, overhead projections and film in the Chapel at the Saint-Boniface Museum in September 2009. Le Musée de Saint-Boniface Museum works with a collection of artifacts that reveal the lives and culture of the Francophone and Métis communities of Manitoba. The Museum is housed in the old Grey Nuns' Convent. Built between 1846 and 1851 for the Grey Nuns who arrived in the Red River Colony in 1844, the structure is an outstanding example of Red River frame construction and is in fact the Museum’s principal artifact. The chapel, with its celebrated acoustics, is central to the Museum space. The collections of the Museum offered a rich source of inspiration and Christine drew on letters, archival film, photographs, books and artifacts. The Museum is the former residence of the Grey Nuns and Christine focused much of her attention on the lives of these remarkable women. 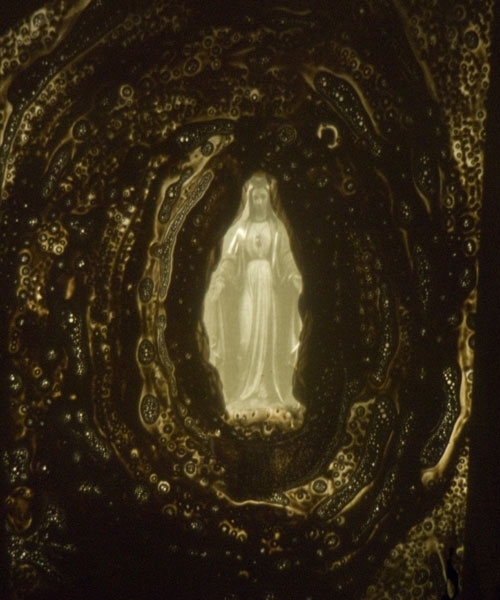 In addition to her collaboration with the Museum, Christine invited other artists into the creation of the work, combining music with film and visual art. The result was a hauntingly beautiful performance at times both melancholy and playful. The chapel provided a deeply evocative space and wonderful acoustics for this outstanding and moving performance. 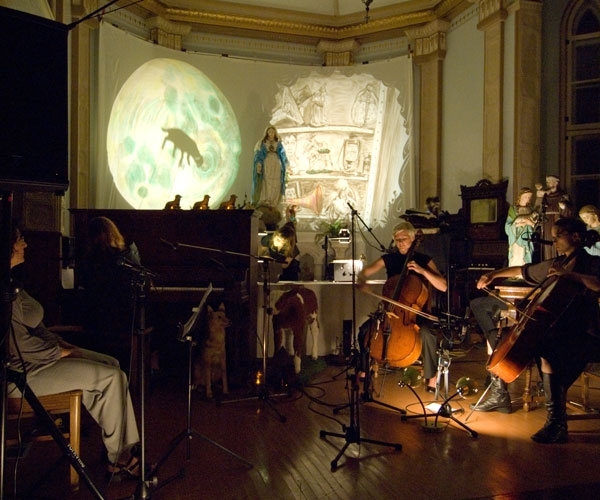 Performers: Christine Fellows (vocals, piano), Shary Boyle (overhead projections), Caelum Vatnsdal (film), Leanne Zacharias (cello, vocals), Alex McMaster (cello, vocals), and Lise Brémault (guest vocalist). Le Musée de Saint-Boniface Museum Artist-in-Residence Christine Fellows chose to make Winnipeg her home in 1992. Within this vibrant and creative community, she developed her distinct style of songwriting. Fellows is also an avid collaborator, and has worked extensively within the modern dance community, most recently as Composer-in-Residence at Winnipeg’s Contemporary Dancers (2007-08). Although she tours internationally, she returns home to create and record her various projects, from her solo work, to commissioned scores, to collaborative performance projects featuring dance and visual art. 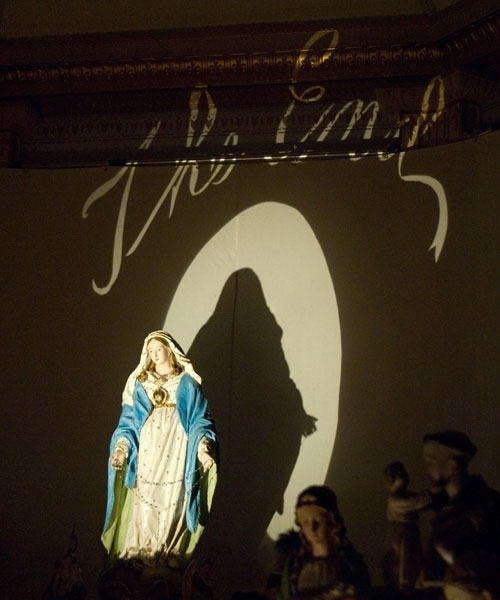 Visual artist Shary Boyle (overhead projection-based artwork): Shary Boyle lives in Toronto. 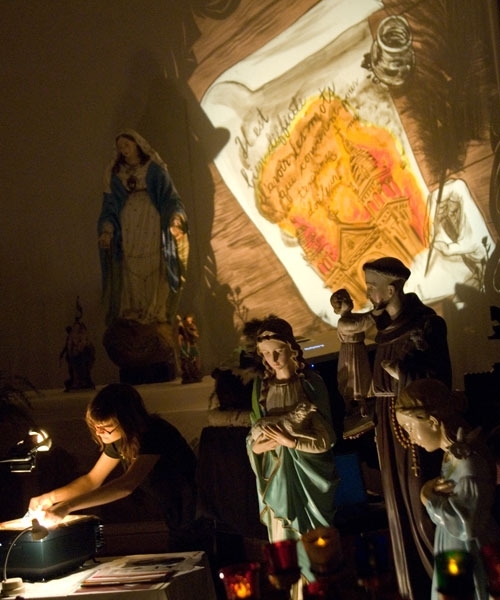 Shary’s artistic practice includes drawing, painting, sculpture and live drawing/projected light performance. Her porcelain sculptures have been acquired by The National Gallery of Canada, the Winnipeg Art Gallery, and commissioned by the Art Gallery of Ontario. 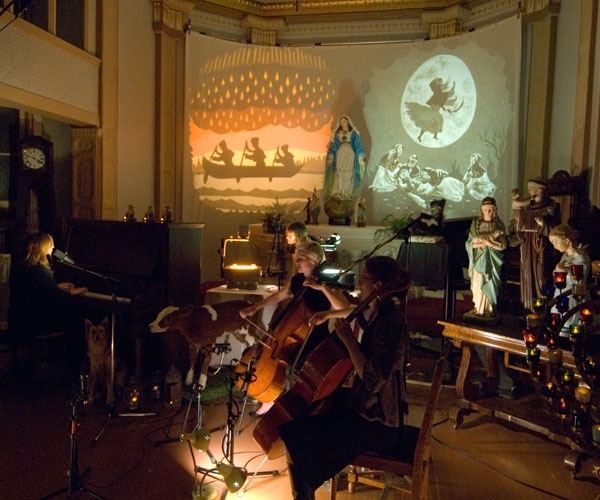 Her work has been presented in several solo and group exhibitions internationally, and she has also presented her acclaimed overhead projection performances widely, from the Olympia Theatre in Paris to the Dawson City Music Festival in the Yukon. Cellist Leanne Zacharias (cello/vocals) is a cello professor and orchestra conductor at Brandon University. She received her undergraduate degree at University of Manitoba, a Masters degree at Rice University (Houston, Texas) and a PhD at University of Texas at Austin in 2009. 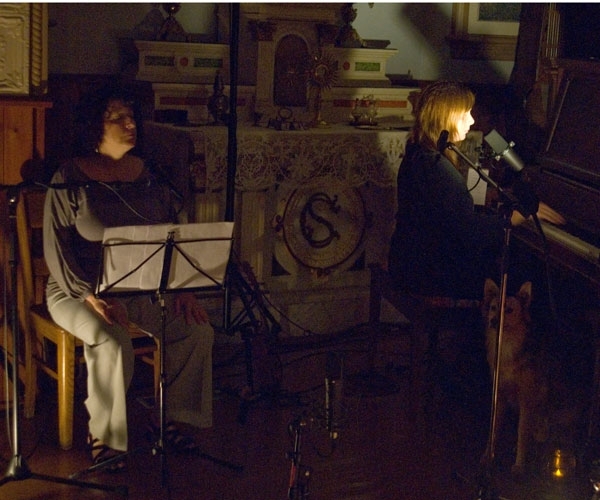 Leanne and Christine Fellows have been touring, recording and collaborating together since 1998. Cellist Alex McMaster (cello/vocals) Alex McMaster is a classically trained cellist who spent much of her childhood overseas, in Africa, Guyana, Bangladesh and the U.K., and she currently lives in Toronto. Since graduating with an Honours B.A. in Music from the University of Toronto, she has toured and/or recorded widely with several groups and artists, including A Northern Chorus, Classic Albums Live, Ron Hawkins, Jane Siberry, Feist, Lily Frost and Christine Fellows. Filmmaker Caelum Vatnsdal lives in Winnipeg and has spent his professional life working on movies, writing about movies, or making his own movies. He has made one feature film to date, along with several documentaries, short films and music videos. He has worked as a cinematographer, writer and special effects artist, and played the character Osip in Guy Maddin’s The Heart of the World. He has authored two books on the subject of film: Kino Delirium: The Films of Guy Maddin (Arbeiter Ring Publishing 2000) and They Came from Within: A History of Canadian Horror Cinema (Arbeiter Ring Publishing 2004). 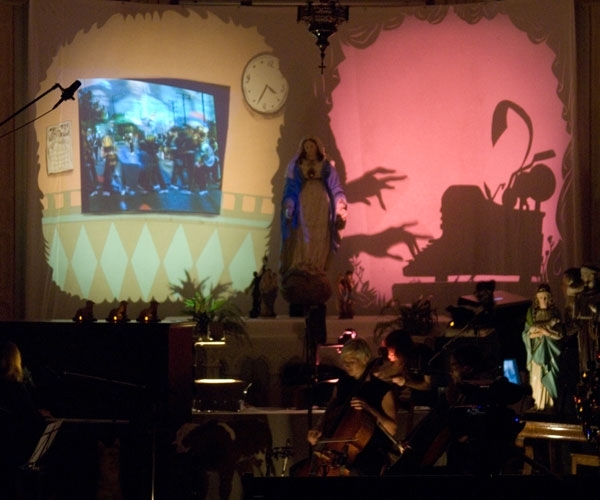 Caelum filmed the performances, and projected film footage shot in Saint-Boniface in 1958, which he edited specifically for this performance project. Guest vocalist Lise Brémault is the Collections Manager at Le Musée de Saint-Boniface Museum. She also performs as a member of Les Blés au Vent, a francophone chorale group, and she has kindly lent her time and talent to this residency project. Recording engineer Cam Loeppky engineered live sound and recorded the musical performances in the chapel. Cam is the co-founder of Prairie Recording Co., a recording studio in Winnipeg. He also tours as a sound engineer for Canadian bands, including The Weakerthans and Constantines. Designer Alicia Smith was the art director/graphic designer for this project. She is a Winnipeg-based graphic designer who often collaborates with fellow artists. Her independent work combines photography and text. Alicia teaches visual communication at the University of Manitoba.